Microsoft .NET Framework is one of the most important add ons that need to be installed in Windows. Luckily Windows 8 or above come with the latest version of .NET Framework pre-installed. In this article, we will look at some of the ways of installing the earlier versions of .NET Framework and fixing the problems that may occur during installation. 1 Why is .NET Framework 3.5 important? Why is .NET Framework 3.5 important? While the latest version of may be .NET Framework 4.5.2 which comes pre-installed in Windows 8.1, there is always a need for the earlier version of the framework which is necessary to run applications requiring the version 3.5 or earlier specifically. Version 3.5 can also be installed along side version 4 or above. This is why it’s important to have .NET Framework 3.5 installed on your system for older applications to work properly. If you are installing an app which requires .NET Framework 3.5 but doesn’t find it on the system, it will automatically show the following dialog. 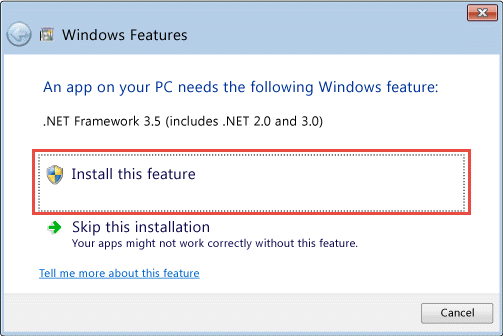 You will only need to select Install This Feature to automatically download and install the framework. This will include both version 2.0 and 3.5 so that the application has all the required files for execution. On the left hand menu, select Turn Windows Features on or off. You can also open this directly using Run –> OptionalFeatures. This will download all the required components from the Internet and automatically install the framework for you. If you don’t have an Internet connection, you’ll need to follow the steps below to install the framework in offline mode. Make sure you have the Windows 8 or 8.1 DVD or the source files to install the framework in offline mode. Otherwise, you can download .NET Framework 3.5 offline installer from the below location and install it by double clicking the downloaded setup. Where D:\Sources\sxs is the path to your Windows DVD or the source. This will enable the feature and will let you know when the process is complete. These are the security updates for .NET Framework 3.5 which must be installed on the current installation of the framework. But since Microsoft applies these updates regardless of whether framework 3.5 is installed or not, they get installed even when the framework is not installed. If these updates are installed first and then you try to install the framework, you will get the above mentioned errors. 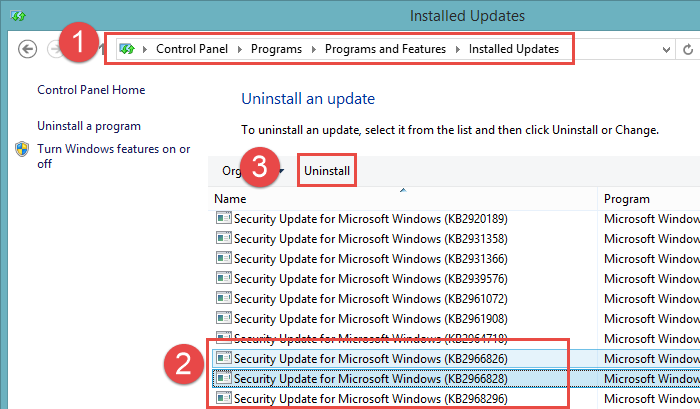 You will need to uninstall the above mentioned updates, install the .NET Framework 3.5 through one of the methods mentioned above and finally install the updates again. 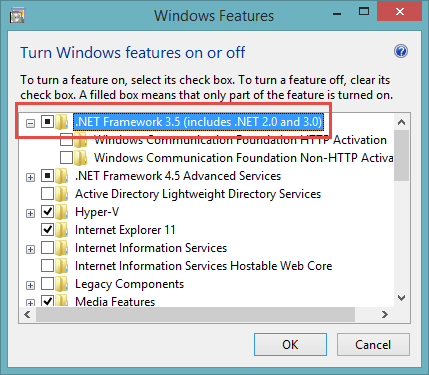 Hopefully this will let you install the .NET Framework 3.5 without any further errors. If you are still having problems with your installation, please let us know through comments below and we’ll try to solve the problems for you. 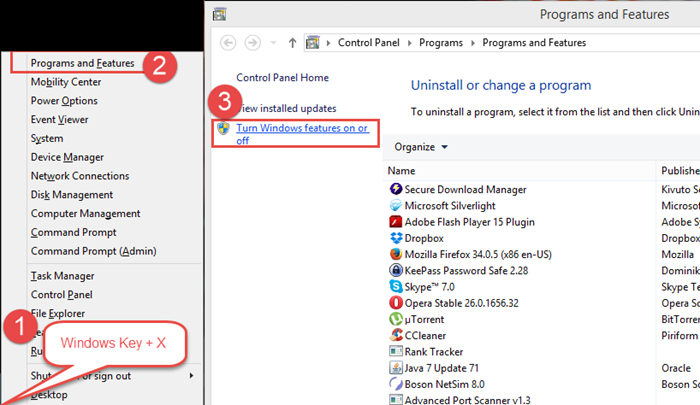 But 6.1, 6.2 and 7.0, 7.1 are not installing on w8. then I unzipped winodows 8 ISO using winrar, extracted only entire sxs folder on harddisk, and changed the path in dimm command to lead to that sxs folder location. And DIMM command then installed without any fuss. 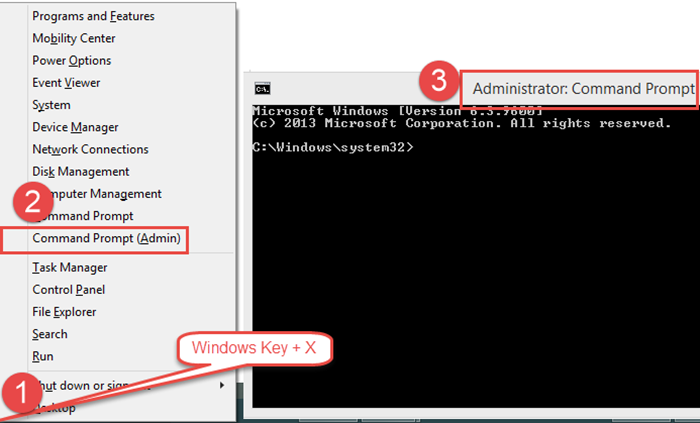 Of course, DIMM command has to be run in a command prompt (Admin). but I could install 2.0, 3.0 and 3.5 using Dism method. So I guess, uninstalling these updates is not really required. After searching a lot, finally this video helps me to fix .net 3.5 framework issue with windows10. After checking with all the above solutions also still i’m not able to fix the issue. Pls help me with the same. The Third method works nice. THANK YOU SO MUCH. Thanks for pointing out. It’s fixed now. Hi I need some help… tried four steps, but the one using the windows 10 disc, that I don’t got. Everytime i tried the answer was always the same, showing the windows features so I can download on demand, even without internet. I tried to disable W Defender but don’t seen to be possible… I don’t know what to do, and the app just run with the 3.5 and the version is win 10. What if: “Specify settings for optional component installation and component repair” does not exist in my Windows 10? I have spent a couple of hours going through every line in GPEdit and cannot find this statement; is there a way to add? I have tried this in Windows 10 and can confirm that “Specify settings for optional component installation and component repair” setting is available in Windows 10. Can you tell which edition of Windows 10 you’re using? sorry for the delay; I’ve been unreachable for the last week or so. I am using Windows 10 Home, 32 bit, Build 10240. Although my ASUS Netbook has a 64-bit processor, with only 1 Gig of Ram, the 32 bit is actually faster than the original Windows 7 Starter that came with it. However, to avoid the first question coming to mind, Windows 10 was a clean install vice an update over Windows 7. 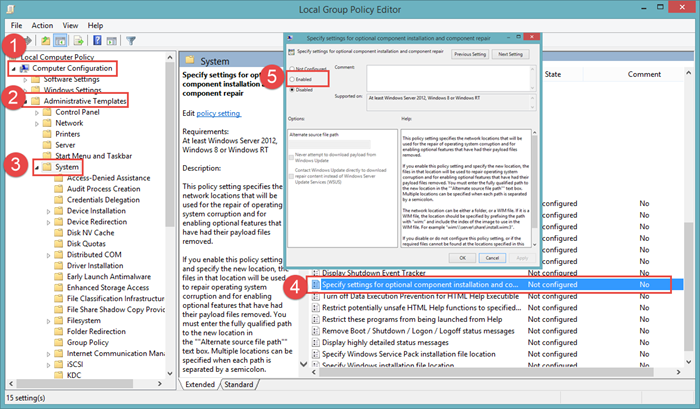 I just came across an article at http://blogs.technet.com/b/askds/archive/2015/08/07/windows-10-group-policy-admx-templates-now-available-for-download.aspx that describes that not all of the group policies were released with the last Windows 10 update, and has provided download and installation instructions. The downside is that the installation did not occur in the default directories; so I now have a Group Policy folder under C:\Program Files\Microsoft Group Policy\Windows 10\PolicyDefinitions\en-us (and folders for all other languages)\*.adml. I believe the file I need is Servicing.adml; however, gpedit does not appear to know where it is; I even copied it to the default policy directory–no help there either. So to make a long story short; I still do not have “Specify settings for optional component installation and component repair” under any of the folders in GPEdit. Since you have mentioned Windows 10 Home edition, I seriously doubt that Windows 10 Home edition actually comes with Group Policy Editor. Are you able to open the Group Policy Editor using Run –> gpedit.msc ? The link you specified deals with the Windows Server side of things which is not normally used on standalone systems. I have not tried it myself but the reviews suggest that it works on Windows 7, Windows 8, Windows 8.1 and hopefully Windows 10 too. If you want to run the Group Policy Editor normally using the Run dialog after installation, You’ll also need to go to “SysWOW64” folder present in “C:\Windows” folder and copy “GroupPolicy”, “GroupPolicyUsers” folders and gpedit.msc file from there and paste them in “C:\Windows\System32” folder. After this, you may want to follow the steps that I have specified in the article. Hopefully this should solve your case. If not, please let me know so that we may proceed further in another direction of solution.